The Single Father's Guide: Where Are All The Single Ladies? So, the quote of the day belongs to Kate Zernike who wrote, "THE news that 51 percent of all women live without a spouse might be enough to make you invest in cat futures[i]." I’d always posited that the attractive and intelligent women who grew up in rural areas found themselves without professional and social opportunities in the small towns like, for example, Buffalo Center, Iowa or Beavertown (no pun intended), Pennsylvania. So, those young women moved to the bright lights of a big city like Chicago or New York where there are jobs, intellectual stimulation, and an occasional gentleman with whom a girl can enjoy dinner, a show, conversation, and romance. If you’ve spent any time on Chicago's Northside, single father, or if you’ve been a member of eHarmony.com in the Metro New York area, you can anecdotally attest to this. 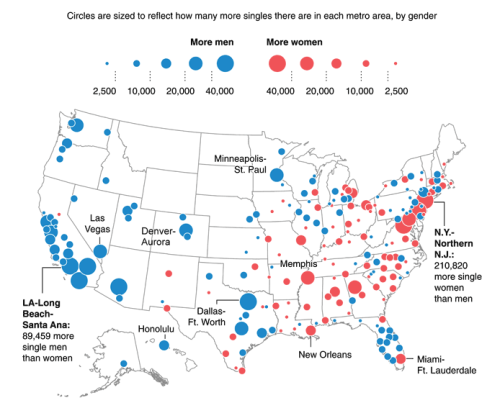 Based on Exlpore’s “Interactive singles map of the U.S.[ii],” there are quite a few more single men in western U.S. urban areas from Seattle to San Diego and from Denver to Dallas, which is opposite the trend observed in the east. So, what gives? The “data suggested that single living was not a social aberration but an inevitable outgrowth of mainstream liberal values. Women’s liberation, widespread urbanization, communications technology, and increased longevity—these four trends lend our era its cultural contours, and each gives rise to solo living[iii].” While liberal values may explain the reason for the increase in the number of women delaying or rejecting marriage, it doesn’t explain the reason there are so many more single women than men in the eastern U.S. and so many fewer in the west. Perhaps, rural life in Colorado are different than that in Pennsylvania. One can't argue that women who live in California are any less socially liberal than women in New Jersey. Perhaps the talented and attractive single women in the western states believe that they don’t have to relocate to urban areas to find the intellectual and romantic opportunities their sisters in the east do. I've even argued with a couple of close friends that there may just not be in some parts of the country enough men who know how to treat a lady. All (or, at least, most) of the gentlemen are taken and the classy women, as a result, simply postpone or choose not to marry rather than compromise. [i] “Why Are There So Many Single Americans?” Kate Zernike. New York Times. January 21, 2007. [ii] “An interactive singles map of the U.S.” Edited by Maria Popova. http://exp.lore.com. Accessed January 14, 2013. [iii] “The Disconnect: Why are so many Americans living by themselves.” Nathan Heller. The New Yorker. April 16, 2012.